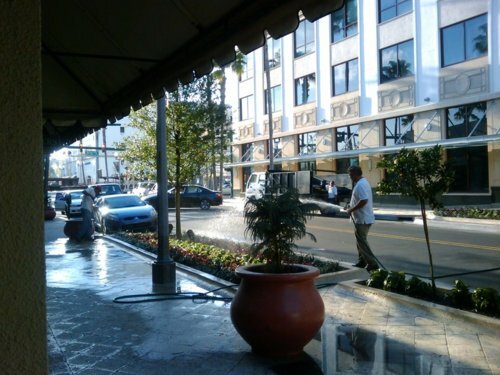 When I first moved to downtown West Palm Beach, I was a bit reluctant to use the Center City Pharmacy. It was clearly the most convenient pharmacy for me to use, given that it is located in between my home and work on opposite ends of Clematis Street. However, I've always used one of the national chains such as Walgreens or CVS. It just seemed that medications, particularly prescription medications, are a subject that is best put in the hands of a large trusted national chain and not a local store. Nevertheless, because of its convenient location, I decided to try out the Center City Pharmacy. The result is that I will never go back to a national chain. The service at the Center City Pharmacy is simply outstanding. I can get my prescription filled there within seconds. I no longer have to suffer standing in those long lines behind angry customers trying to work out details with bewildered-looking pharmacists at the national chains. Tom, the co-owner of the pharmacy, is truly professional in all respects, and knows all of his customers. His operation is extremely professional and efficient. He and his staff appear to have complete control of the complex web that exists in today's world of pharmacy, dealing with doctor's handwriting, insurance companies, copayments, etc. in a professional, accurate, and rapid manner. Tom's Center City Pharmacy is located right across the street from the City Center construction. Business is clearly brisk at the pharmacy, even though the City Center complex is not yet complete. It must be the combination of the good location (1/2 block from the major bus stop at Clematis and Quadrille) and the unmatched superior service. This is one business that is likely to continue to do really well, despite the down economy. Business will only pick up further once the City Center is complete. It's nice to have a super high quality pharmacy right in the middle of Clematis Street. 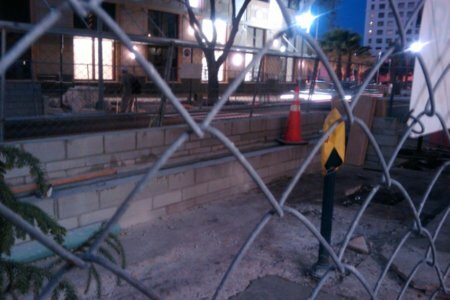 What are the two concrete slabs that have just appeared in the middle of the 400 block of Clematis Street? One is right next to the Clematis Street entrance to the future new library in City Center and the other is directly across the street (see picture below). Does anyone know what these are going to be? A few days after these two structures were noted as in the above picture, the one on the north side of the street (right in front of the door to the new City Center library) was torn down, and the pieces of stone were seen leaving the scene. Maybe we'll never know what it was, maybe a mistake of some kind ... go figure! A few days later, the structure on the south side was also torn down. Below is a picture of what remains. 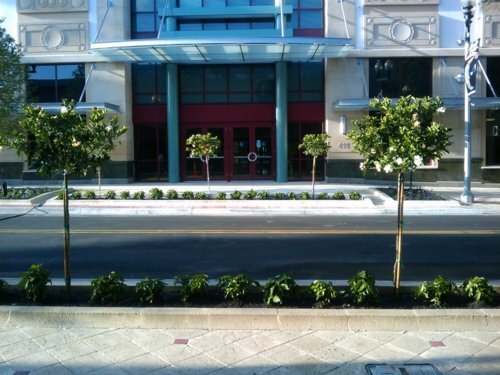 After the strange structures were demolished, the sidewalk was nicely landscaped and flowers were put in. 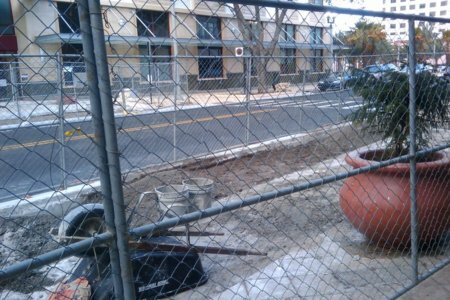 Now the area in front of the new library in the middle of the 400 block of Clematis Street looks great. Below are two pictures.